What is the best wine to drink in the Spring and Summer? Rose wines are made all over the world in so many different styles. Light, Dark, Still, or Sparkling, everyone has their own way of making them. So how is Rose made? There are two main types of Rose out there. One is when a winemaker will blend a white wine with a red wine. More commonly, however, is when winemakers limit the amount of time the juice is kept in contact with the skins during maceration. Surprising to a lot of people, the color of wine does not come from the juice inside the grape. It actually comes from the skins. By limiting the time that the juice spends in contact with the skins, it will limit the amount of color that will be in the wine. Different winemakers from different regions vary the amount of time their wines spend in contact with the skins, thereby affecting color, concentration...you get the picture. In France, winemakers are more known for very minimal skin contact, which is what gives the very faint, light color. That will usually indicate that the wine will be more crisp. Spain and Italy are more known for their darker rose, which will be bolder and fuller in flavor. This is something that comes up a lot, and we can thank White Zinfandel for that. Yes rose is pink like White Zinfandel, but the overwhelming majority of rose is made dry, with little to no residual sugar at all! The French are most known for their rose being as dry as their whites. Tart cranberries and cherries on the palate, with a lean, crisp minerality. In Italy, they can be richer in flavor, presenting with riper fruits and bolder structure, but the wines are still very dry and not sweet at all! How do you find the right rose? Rose, just like white wine, has a wide range of flavors and styles. You can really base it on the style of white wines that you drink. If you like Pinot Grigio or Sauvignon Blanc, you will like the lighter styles. They are crisper and easier to drink. If you are a Chardonnay fan, you would like the Italian or the Spanish styles of rose. They are darker which makes them richer and more structured. The weather is getting nicer, and it is time to stock up on all of your favorites. There is nothing like sitting outside in the sun, sipping rose, without a care in the world! 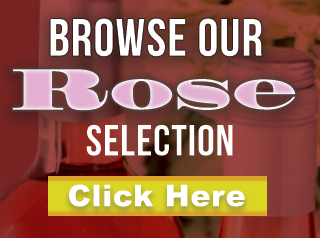 Click here to browse our current selection of Rose offers!